"On 5th August 1473, at only 21 years of age, Leonardo da Vinci accurately dated the most important landscape drawing in the whole of the history of art, as well as from a graphic side that underlines scientific-analytical and optical-perceptive concepts". Thus we read in one of the countless publications related to the works of Leonardo da Vinci, on the famous drawing bearing the note "Dì de Santa Maria della Neve 'addi d'aghossto 1473", a landscape study preserved today in the Uffizi that would testify the presence of the genius the day in which, in the town of Montevettolini, the feast of the Madonna della Neve was celebrated, as is still held on the first Sunday of August. Behind this very important drawing there could be an intriguing story about Montevettolini. The story is told by the journalist, writer and director, Dante Marraccini, born in the historic village that today, after a shining career spent mostly in Rome, has become his retreat. "At the beginning of the '80s" - says Marraccini - "Don Elio Mazzoncini, then pastor of the church of Montevettolini, told me he had found among the papers of the archive a drawing by Leonardo, which also had some notes that testified to his presence on the territory , where currently the Church of the Madonna della Neve is (built at the beginning of the seventeenth century, on a pre-existing margin or tabernacle of the end of the fourteenth century). It is clear that Leonardo da Vinci was to oversee some works of art that can still be admired today in the church of San Michele and Lorenzo and which date back to the Florentine school of the Medici era". The landscape featured in the important drawing by Leonardo is almost a photograph of the places that are still recognizable today, the view that dominates the valley, the water course attributable to Le Rave, while the side of the hill (Monsummano Alto) appears still intact unlike the present day hillside, because of the past quarrying done there. The story of Dante Marraccini continues: "Don Elio told me that he had handed over the design to a Fine Arts intendant for a judgment of authenticity, through in-depth studies and exams. But the drawing was never returned to Montevettolini". 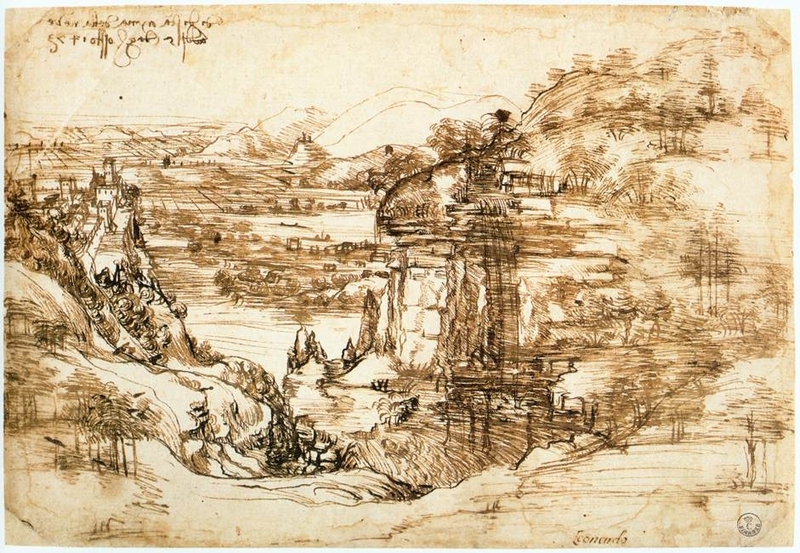 The drawing "Paesaggio con fiume", is now kept in the Gabinetto dei Disegni e delle Stampe of the Uffizi in Florence, where it claims that it comes from the Medicean Lorraine Fund. It seems that sadly now the idea that the drawing described by Don Elio will not be returned to Montevettolini. That said, albeit with some perplexities and with the benefit of inventory, Marraccini would like to know - after all the confirmations of the case given by the experts who examine masterpieces at the Uffizi in Florence – given that the drawing is kept at the Gallery he hopes that the dream of the drawing being returned could come true, as it seems that some works of the most important Florentine museum may soon come to Montecatini, in the form of an exhibition including the drawing in the area where it was conceived by the brilliant hand of Leonardo. 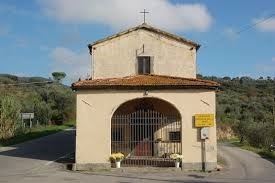 It is thought that Leonardo drew this drawing near the Oratorio Madonna della Neve in Montevettolini, shown below. 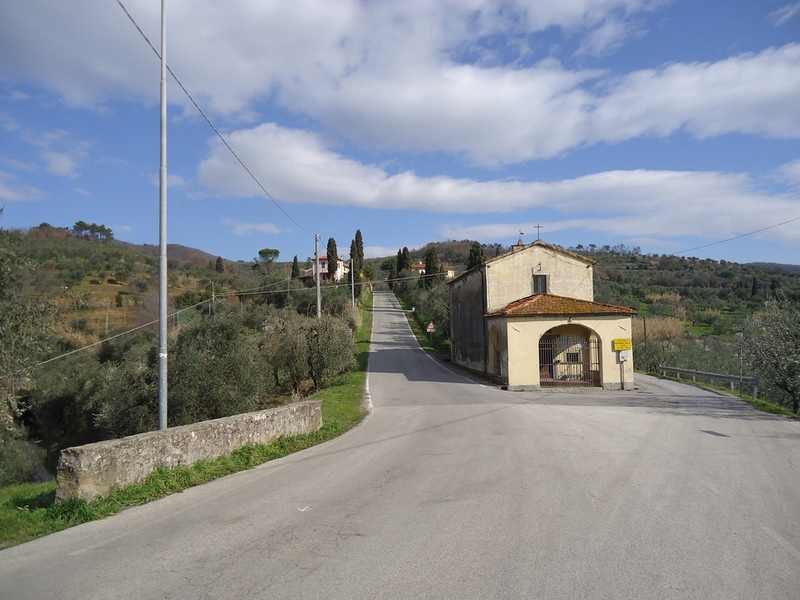 The road to the left of the Madonna della Neve runs up to Podere San Martino. A closer look at the Madonna della Neve.